One of the amazing facts about the Indian kitchen is that it is home to ingredients that can double up as health and beauty remedies as well! One such ingredient is – no, not the chilly, but the Turmeric!! Known to have excellent antiseptic and antibacterial properties and is also effective in reducing the amount of oil secreted by the skin on our face. Using them in our everyday routines is easy – turmeric can be mixed with quick-to-prepare home remedies and provides a more flawless and beautiful you in a matter of minutes. Turmeric also has great antibiotic properties, which adds on to the overall health of your body, along with its beauty. 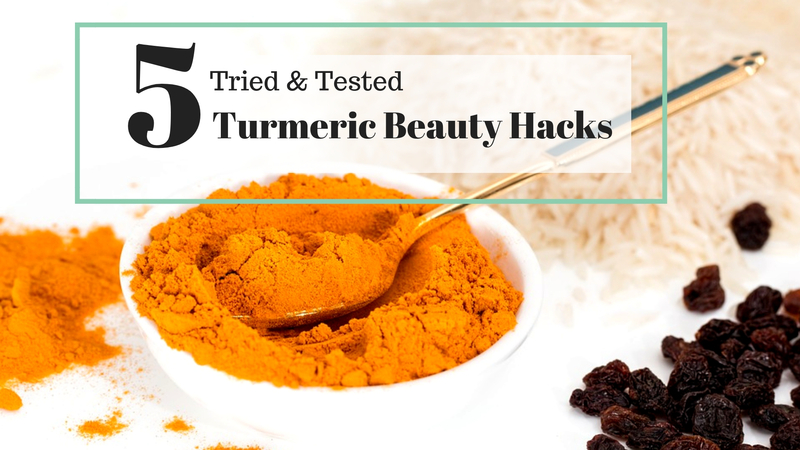 So here are 5 tried and tested turmeric beauty hacks with additional ingredients that are easily available in your household! Simply take a tablespoon of regular wheat flour, add 1 teaspoon of honey, 1 teaspoon of turmeric and some milk, enough to make a paste. Mix it well and apply it onto your face and let it dry like any regular face mask. Wash it off with plain water and notice the radiance. This remedy can be used on a daily basis for radiant, soft and moisturized skin. Take a cup of gram flour (besan) and mix it with ¾ cup of fresh milk cream (malai). Add 2 tablespoons of turmeric to this mix. Apply this pack on your skin with gentle massage strokes and let it dry for about 5-7 minutes. Make sure it does not dry out thoroughly. Before it completely dries up, start scrubbing in a circular motion and remove all the pack from your skin. Proceed with a gentle warm water bath, without using any soap. It will be a good idea to spread some newspaper around while scrubbing to avoid a mess. This body scrub is an age old remedy and common in most households. This pack is a boon for people with dry and dull skin. Simply take some coconut oil and mix a heaped teaspoonful of turmeric to it. Use an old yet clean toothbrush and apply this mix on to your teeth and gums. During summers, you may want to chill this mix before you apply it on your toothbrush and brush your teeth with it. After thoroughly brushing your teeth with this mix, leave it on your teeth for 5-7 minutes, and then rinse with water. Then, proceed with regular brushing to remove any yellow stains that remain. This may tint your toothbrush as well, hence using a spare old toothbrush is recommended. This mix is safe to ingest, so if some amount gets swallowed because of being in your mouth, don’t worry. The only harm it can cause is bad taste. Mix a tablespoon of turmeric with 3 tablespoons of rice flour. Grate a tomato and filter it to get 1 tablespoon of tomato juice. Mix tomato juice and some raw milk with turmeric and rice flour to make the mask. Apply this mask onto your face and neck and let it dry. Once dried, rinse it with tap water and do not apply any cream or lotion on your face. It is best used before bedtime and can be used every day. Mix a teaspoon of turmeric, a teaspoon of sandalwood powder and make a paste with the help of lemon juice. Apply this paste onto your skin and rinse after 15 minutes. This can be used a few times a day, for a few days, until the acne diminishes. Remember to apply only on the acne since it can have drying effect on the skin. Turmeric is a very easy ingredient to add to any of your daily routines. Using turmeric with your food on a daily basis is a regular Indian practice and very good for our health. You can also replace 1 teaspoon turmeric powder with half a teaspoon of fresh turmeric root paste. The turmeric root is a bit pungent so be careful when adding it to your face and body scrubs for the first time. You can also simply purchase turmeric supplements or turmeric pills if the root is not always available for you. Do try these and let us know how they worked out for you! If you liked reading this blog, do SHARE it ahead! Great post Prisha and I agree turmeic is a great natural agent that has so many health and beuty benefits. I had used most of this hacks and I could say confidently that they all worl greatly. I remembered my mom reading this post, she used to give us Turmeric in many ways , be it in milk or as a scrub or even for cleaning teeth. I know about the face pack and scrub but had no idea turmeric can be used for teeth whitening too. These are traditional DIYs and very effective. I too use turmeric in many of my skin treatments. Its magical. Can see the difference in a week’s time. You have shown the ways to use turmeric to a very good effect. These hacks are pretty useful beauty hacks using turmeric. Turmeric is definitely a great ingredient for skin hacks. I will definitely try the one you shared for acne. I hope it helps. I had no idea that turmeric could help in teeth whitening as well. Now that’s something I would love to try first. Turmeric has antioxidant property and some awesome skin benefits. Thanks for sharing such useful tips . I’ve used turmeric for face pack and used for my acne treatment but never know that it works for whitening teeth. The last time I used homemade turmeric infused scrubs n face packs was during my wedding. I remember how my skin was glowing on my D-day. But I was not aware that turmeric can also be used for teeth whitening. Thanks for sharing these amazing hacks, I will share these with my friends too.